Integration or syncing marketing activities are not new; brands who have tested the success of such campaigns want to repeat it. However, there are a lot of recognized and renowned brands are struggling to allocate their marketing budget in more efficient manner. As they are still confused, whether put money in online or offline campaigns. 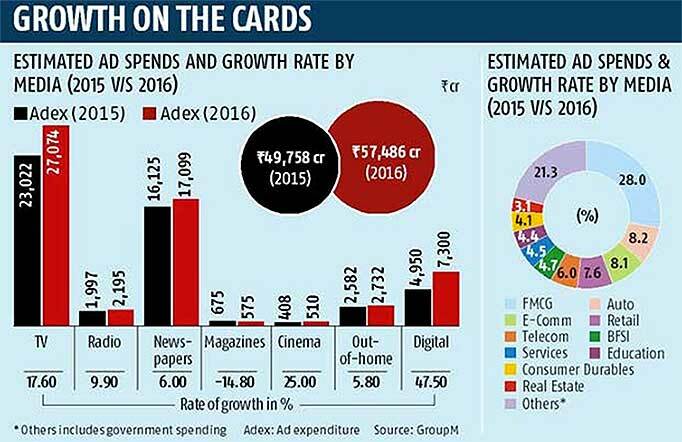 All above projections clearly explain how digital media is emerging as one of the most effective platform YOY. But it will become more effective when synced or integrated with the offline campaign. Generally, brands have a separate team for online and offline marketing and both have their individual goals such as for online getting traffic on the website, increasing fan base on social etc. Same for offline as well for example creating the brand image through various offline channels TV, Mall activation, print etc. At the end after spending hugely on marketing activities the biggest problem brands often comes across is inconsistency in their message because of using various platforms or we can say inconsistency due lack of not syncing their activities. In Most of the scenario objective of any branding or marketing activity is to enhance brand visibility & brand recall. As per traditional marketing approach or we can say basics of marketing: “the customer needs to be exposed to a message 7 times before making a buy”. However, statics shouldn’t be taken as thumb rule but the principle remains same. Brands need to consistently showcase their message to the consumer to create a brand image or increase brand recall. An easier way to spread the message to a target audience is using multiple channels across different mediums and it will create good brand impact if they are carefully chosen. But another impressive way of doing it more efficiently and effectively, which too many marketers overlooks “using integrated campaigns to keep your branding message consistent across all channels”. Consumers are more likely to recall or connect with the brand if they see the core messaging of the same brand on every medium, regardless where they are hanging out. Events are still a standout amongst the best approaches to engage the audience. Providing activities like selfie station will allow the brand to take their social media details & later brand can utilize details to engage with them on the various social channel. Social Media: To boost the exposure you gain from the event, you may photo competition where attendees have to take a photo or video of the occasion and advance it through social channels with a comparing hashtag. You don’t require a third-party tool for this since hashtags are effectively searchable on most of the social channels such as Instagram, Vine, and Twitter. To announce a winner, search for the particular hashtag to see the entries made by your audience. With the ascent of live streaming applications, for example, Periscope, you may likewise give a live feed to the individuals who couldn’t go to however are keen on your event. Microsite: Generally known brands launch a microsite, landing page or an application that’s made specifically for the event. They create a subdomain or dedicate a single page from website to promote an event and increase conversion at the same time. Half of online brands develop the microsite to promote a new campaign, including events. However, microsite layout must be carefully designed to maximize user experience. An advertising agency can help you with anything from branding to sponsorships and events. Don’t stop your digital strategy after the event: Update your landing page with photos or short clips of the event. After creation of microsite, the next step is to drive in traffic. Search Engine Optimization or SEO is not practical for promoting a new microsite as it’s a time taking process. Instead, focus on sharing a link to microsite through social channels, paid media, and email campaign. Email Marketing: Still one of the cheapest ways to promote your campaign. It’s one of the traditional and most effective medium used by brands to promote their events. You should already know the kind of information and subject lines that will grab audience attention. Encourage them to learn more about your event by placing a link to your event microsite. While creating email template and content, a good strategy would be to make it responsive. The reason behind most of the people now a day will be reading your invitation on the mobile device. Like your microsite, your email should get straight to the point and highlight the advantages of attending your event. Also include a social sharing link to encourage your audience to invite their friends to attend. Creating an email list may take time, but it can provide you with an efficient lead generation and nurturing channel for the long-term. To keep your digital strategy going for future events, make sure to collect the email addresses of those who attended your event. Offer something valuable in return for their contact details, like freebies or a free consultation about your product or service. After gathering new email leads, you should send a follow-up email to express your appreciation for their participation. Using QR codes are another effective way to bridge online and offline campaign. You can utilize offline campaigns such as sharing QR codes in magazines or newspaper to redeem discounts online. Vice versa share QR codes for a special promotion on the website or Facebook page. Your consumers will be able to use it at your physical business to get special discounts. Now advertisers better understand the purpose of QR codes in the eyes of consumers, so now, brands can more efficiently apply QR codes campaigns. Most important thing we can learn is QR codes are an effective marketing tool when we offer significant value to QR code users. Download contact information, Display coupons, Connect to social media, Display reviews, loyalty program members, contest entry form, Mobile payments, Offer product details, directions to your business, Scan a paperless ticket, and E-mail newsletters. Buyers are becoming increasingly open to scanning QR codes, so now is the perfect time to start exploring the marketing potential for QR codes. QR codes may not be the easiest marketing tool to use effectively, but they’re powerful with a strategy to back them up! Cross-gadget or device advertising is an effective approach to help engagement. For instance, connect with clients who are sitting in front of the TV while additionally utilizing their desktop or cell phones in the meantime. One study from Google found that retail advertisers have seen the increase in conversions by 16 to 18 percent by utilizing cross-gadget promotion. Multi-screen crusades were characterized as those that keep running amid a comparable time period crosswise over two or more screens including TV, PC, tablet, cell telephone and computerized place-based media. 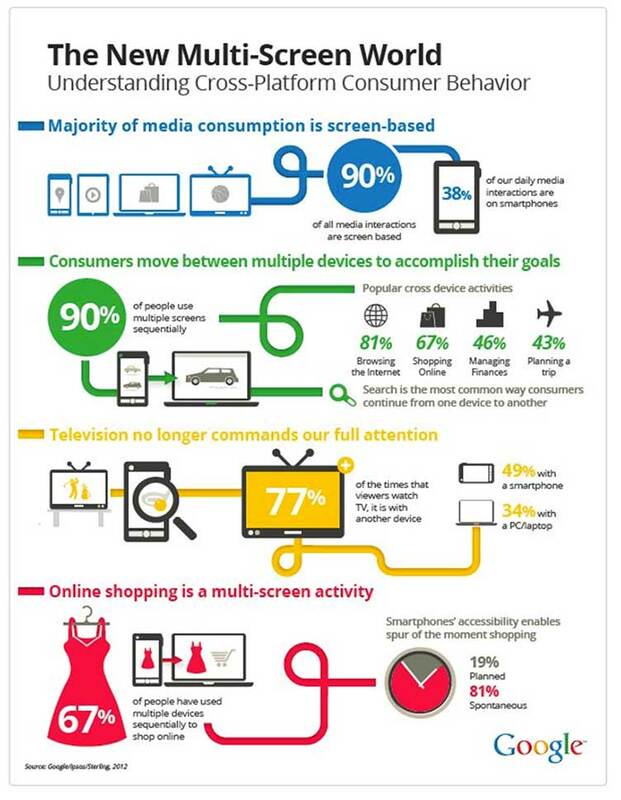 Image Source: GoogleEstimation is the greatest issue for multi-screen promoters. The lion’s share (71 percent) said they utilize an assortment of measurements particular to individual screens, however, 73 percent said they would want to utilize only one arrangement of measurements over all screens. The challenge for advertisers is in following those cross-gadget transformations. With an end goal to help them do that, Google a year ago began reporting cross-gadget information in AdWords. Presently, it’s noteworthy a portion of the transformation inspire benchmarks it has seen over numerous commercial enterprises and in four nations. Standard business cards incorporate an e-mail location and site. Tech-friendly Owners find different spots to promote their online networking channels. Menus, business vehicles, and flyers are all great spots to distribute your online networking data. Urge purchasers to associate with you on Facebook, Twitter and so forth. Who are your core clients, and which stages do they utilize the most? It’s hard to publicize the greater part of your online networking profiles, so pick the ones your clients are utilizing. Consider you overall marketing goal, instead of treating online and offline as a separate medium. View them as pieces of overall marketing strategy. Make a core message more consistent that resounds with your audience across all mediums.